(From left) Mitsutoshi, Lim and Hiroshi shake hands to formalise the MOU between Nextgreen, Nomura and IHI. 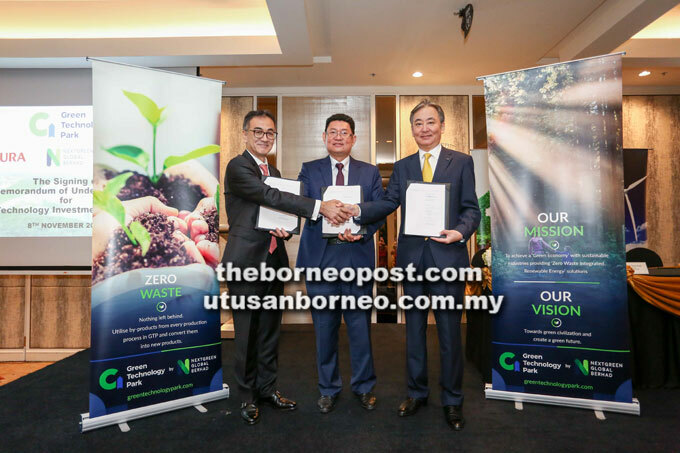 KUALA LUMPUR/TOKYO: Nextgreen Global Bhd (Nextgreen), Nomura Holdings, Inc (Nomura) and IHI Corporation (IHI) yesterday entered into a Memorandum of Understanding (MoU) to explore collaboration and investment for Green Technology Park in Pahang (GTPP), Malaysia. GTTP was conceptualised and put forward by NGGB as a pioneering new industry model, aimed at leading the world towards achieving a higher level of environmental consciousness. At the core of the project is the idea to revolutionise the printing and publishing industry by providing a new source of eco-friendly and sustainable pulp and paper, while providing Malaysia with security with regards to paper supply source control. The MoU allows the three parties to evaluate potential collaboration involving NGGB’s technology of converting palm oil wastes into pulp and paper, IHI’s proficiency in renewable energy and Nomura’s financial expertise. Situated on 410 acres of land in the state of Pahang, GTPP is the brain child of NGGB managing director Datuk Lim Thiam Huat to bring Malaysia to the world stage on renewable paper and pulp products and create greater environmental awareness through the efficient utilisation of palm oil industry wastes and biomass to produce ’green’ products. The MoU facilitates a joint feasibility study to evaluate potential cooperation in the development and management of power generation and other auxiliary facilities for the second and subsequent phases of GTPP. The study will also explore research and development into areas such as the effective utilisation of oil palm wastes and extracts. Hiroshi Ide, executive officer and vice president of Resources, Energy and Environment, at IHI, said: “We bring to the table our vast experience and knowledge in energy solutions and have begun commercial operations to produce fuel pellets made from empty fruit bunch (EFB) of the palm fruit. IHI is one of the largest heavy-industry manufacturers in Japan and has created value for customers through engineering know-how for more than 160 years. The company has extensive experience as an Engineering, Procurement and Construction contractor for the supply of boilers for coal-fired power plants in Malaysia. It recently enhanced its renewable energy business and has developed technologies supplying solutions to the palm oil industry.